We are looking for foreign versions of the Magnavox Odyssey console. Note: The historical data contained in this section were extracted by permission from Ralph Baer's book about his long experience of father of the video game. After more than two years of work on TV gaming systems at Sanders Associates, Ralph Baer and his two coworkers Bill Harrison and Bill Rush ended up with a prototype unit which played 12 games using mylar overlays, some of which used a light gun. They had also developed the so-called dynamic ball action "de/dt" chassis to offer more advanced game features. Called the Brown Box because of its simulated woodgrain self-adhesive covering, the Brown Box was used to take the project to the next and most important step: finding a licensee. Demonstrations were made to Cable TV system operators Teleprompter in 1968. When that failed to jumpstart the industry, TV manufacturers (Zenith, Sylvania, GE, Motorola and RCA) were contacted in order to find a licensee. None of the demonstrations to these firms ended up with a license agreement. Fortunately, Bill Enders, a member of the RCA team, had left that company and moved on to become a marketing VP at Magnavox in their New York sales offices. He had been thoroughly impressed with the demonstrations of the Brown Box. During the month of July of 1968, Enders came up to get another, personal demonstration; he got even more enthusiastic and urged Magnavox management, headquartered in Fort Wayne, Indiana, to take a second look at the game concepts. Here was another guy with vision. In July, Ralph Baer and Lou Etlinger, Sanders Associates’ Corporate Director of Patents, received an official invitation to come and demonstrate the game in Fort Wayne. Lou and Ralph got on an airplane on the 17th of July and flew to Indiana for that all-important demonstration. Magnavox gave them the use of their boardroom and one of their 19-inch TV sets; Ralph set up the TV, along with the Brown Box, the light gun, and the golf putting device. One by one, a large number of people filed into the room. After their boss, Gerry Martin, arrived, the demonstration started. Ralph's recollection is that of a room full of guys sitting around a long, dark conference table, looking generally glum and non-committal. No one showed any visible degree of enthusiasm except for one man in the room: The VP for Marketing of the television set division, Gerry Martin. He immediately saw a novel product category for Magnavox… and he was the boss! He made a decision right then and there to try and push ahead with a Home TV Game product. Gerry Martin still had to convince Magnavox corporate management to support his decision to build games in their Morrison, Tennessee TV set manufacturing plant. It took until March of 1971—nine months later—for that to happen. A preliminary agreement was signed between the two companies, Sanders Associates and Magnavox. 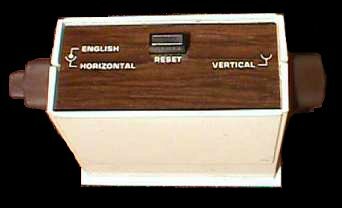 Once that was in place, the Brown Box and all the design data turned over to Magnavox engineers in Fort Wayne; they got started on a prototype for what was to become their first Odyssey (Model 1TL200) TV Game in 1972. Bill Harrison and Ralph made trips to Fort Wayne in March and June of 1971 to help with technical and marketing decisions. Bill spent much of his time with George Kent and other Magnavox engineers assigned to the project. Meanwhile, Ralph worked mostly with Bob Fritsche, who had become Magnavox’ Odyssey program manager. The major concern was to define all the games that the machine should play; what the colored overlays should be like, Magnavox having decided in their corporate wisdom to leave out the color circuitry, so they could save some money. There were extensive debates about which games were to be included with the basic Odyssey product and which were to be set aside for after-market sale...and so on. Ralph and Bob Fritsche worked well together. The circuitry designed into the Brown Box at Sanders was essentially copied with a few exceptions: Components for colored backgrounds were thrown out in favor of the plastic screen overlays. 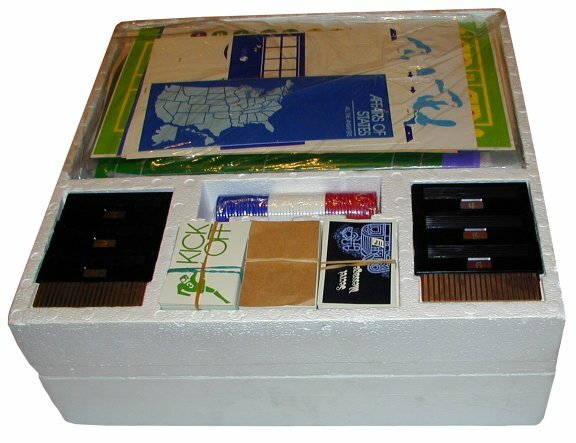 The sixteen game-selection switches on the Brown Box were replaced with plug-in programming cards—an excellent decision! Some new games were added. Unlike the design of the Brown Box, the 1TL200 unit had one large printed circuit board (the mother board) into which several small "baby" boards were plugged. The small, modular boards contained the various sub-circuits, such as the ball spot and player spot generators, the H&V sync signal generators, and so forth. This method of construction simplified the motherboard design and lowered its cost. Prototype development at Magnavox was completed by George Kent’s group in the summer of 1971. Two market surveys were made in July and in October 1971 in order to determine what potential customers thought of the concept. Amazingly, a large number of them disliked the cartridge concept: they thought they could get lost or broken by kids. But Magnavox kept the concept. 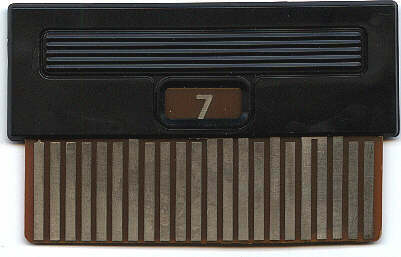 Once George Kent had taken the final design of the game unit and antenna switch-box to the FCC labs in Washington and passed their tests (another thing that millions of video game units would be subjected to in the incoming years), Odyssey went into production at the Tennessee plant in August 1972. A number of hand-assembled units were sent to Magnavox’ captive dealers shortly before. The response was phenomenal: The best thing to come down the pike in years! was the general consensus. The consumer-electronics press carried articles about an up-coming "mystery product" from Magnavox. There was much speculation in the trade press just what that "mystery product" might be. At about the same time that this New York product line presentation took place, other Magnavox dealerships in major cities throughout the country laid on similar shows for the press and for their captive dealers. Over the following months, Magnavox began supplying these dealers with production units. They also started shipping a very nice-looking, pump-action plastic rifle, for which they provided a separate, large, in-store easel display. Magnavox also shipped their dealers ten additional games available separately, or in a pack of six (as six games were originally planned and another four were released later in 1973). A handsome flier was widely distributed. 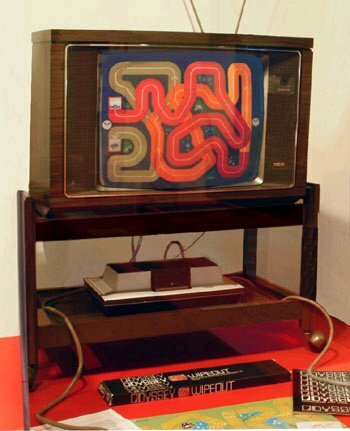 It introduced the idea of Home TV Game Playing. It showed the basic and optional Odyssey games and the shooting gallery games. The Home TV Game industry was launched for real! Unexpected problems soon began to haunt the program: First off, Magnavox featured Odyssey in their fall TV advertising in such a way that everyone got the impression that Odyssey would only work with Magnavox TV sets; then they set the price at a steep $100 for the game unit plus six program cards that could play twelve different games using overlays; and finally, they decided to charge another whopping $25 for the rifle, which, of course, made it all a hard sell. Secondly, sales were restricted to Magnavox’ franchised dealer stores. In the 1960s and 1970s, Magnavox did not sell their TV sets, radios and phonographs through independent stores or mass merchandisers such as Sears or Montgomery-Ward. Naturally, that narrowed the potential sales base considerably. On the positive side, and in spite of all of these marketing and sales gaffes, Magnavox' TV ad campaign (including a television commercial featuring old "Blue Eyes", Frank Sinatra) helped spark up sales in the fall. Over 130,000 Odyssey’s and 20,000 Shooting Gallery rifle packs were manufactured by Christmas 1972. Who knows how many more would have moved off the shelves that holiday season, or the next, if Magnavox had enjoyed broader distribution. Restricting Odyssey sales to "authorized” Magnavox dealerships was a huge handicap. Magnavox would be forced to eliminate this marketing and sales scheme a year later when they were sued by the Government for restraint of trade. But by early 1973, Odyssey games were already being discounted (see advertisements below). Foreign sales took up some of the slack, starting with a Mexican export in October 1972 (Magnavox Odisea). 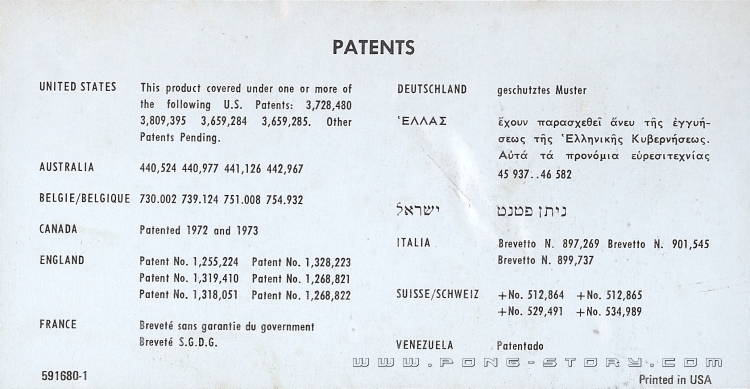 Another export in Germany took place in late 1973 (see the ITT Schaub-Lorenz Odyssee). The 1974 French ad for Odyssey shown here is typical of the advertising in Europe. Magnavox also mismanaged the sale of the additional plug-in game packs. These featured some of the best games, such as Volleyball, Handball, Baseball, Wipe-Out, Invasion, and Fun Zoo. All those packs wound up under the store counters for after-market sale, but since Magnavox neglected to train sales personnel to "push” the packs, not many of them were sold. While the Odyssey game was being demonstrated at Bowling Greene in New York in April 1972, another new-product show was open to dealers and the invited public in Burlingame, California at the Airport Marina. On the 24th of May, Nolan Bushnell, later the President of Atari, signed the visitors’ guest book and attended that product line demonstration. There he played an Odyssey unit hands-on, including, of course, its Ping-Pong game. Years later, during various depositions, and in Federal Court, Mr. Bushnell would allow as how the Odyssey Ping-Pong game he had played in Burlingame wasn’t very interesting. However, the fact that he had actually played the Odyssey Ping-Pong game that May made his revisionist story unconvincing to the court. In his design of an arcade game, Alan Alcorn had the freedom to use about 70 integrated logic circuits—so-called ‘7400 series TTL IC’s, to be precise. That was a perfectly sensible way to go with a design for a coin-op machine that cost many hundreds of dollars, but it was a totally inaccessible route at the time for the Home TV Game designer. As it turned out, Alan Alcorn did a great job, improving on the basic Ping-Pong features of the Odyssey machine by providing a segmented paddle for vertical ball control in place of Odyssey’s "English" control, and by adding wall bounce and scoring; most effectively, he came up with that PONG sound, which gave the game an unmistakable character. 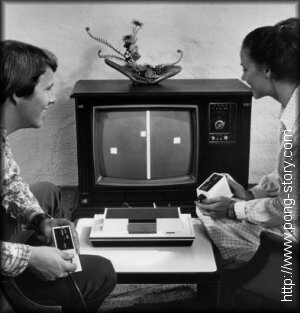 As just about everybody knows, PONG quickly became a great hit in some of the bars and arcades of America; PONG can clearly be credited with having starting the coin-operated arcade video game industry with a bang! Video games, both of the Home TV Game variety and Coin-Op Arcade Video Games, were launched. 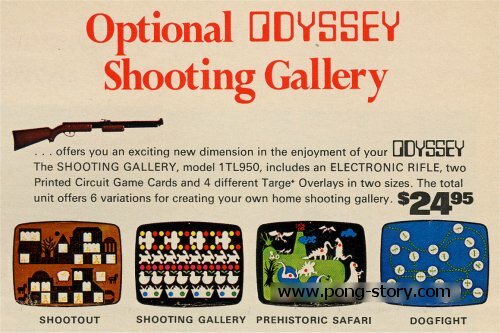 There is also no doubt that PONG helped Odyssey sales late in 1972...after all, an Odyssey game system was the only way you could have some of the PONG experience at home. The rest, as they say, is (video game) history. The Odyssey was packed in a large two-level styrofoam box. The lower level contained the system, the two hand controls, the RF cable, the switch-box in its own black Magnavox box, a pile of paper money and a roll of scotch adhesive tape. The upper level contained the remaining accessories: two sets of overlays (the two sizes accomodate most television screen sizes), a 36-page user manual for installation and game rules, various instructions on paper, six cartridges,	several sets of game cards, two dice, the scoreboards, a sheet of stickers, a set of plastic tokens (red/green/blue), six red Eveready batteries*, etc. Customers could also buy a special carrying case, an AC adaptor, the Shooting Gallery pack (electronic rifle), and up to ten additional games. When stored in the carrying case, the overlays were rolled up and stored in the upper part. A special free game called Percepts was also mailed to customers who registered their Odyssey. There are several variants of the Odyssey, the rarest being the export models. At least two Odyssey clones existed as well. The Odyssey pictured with the television set on the left is a permanent exhibit of the Wisconsin Historical Society and is set up with the Wipeout add-on game. This specimen was originally purchased for Christmas 1974. Other American museums like the Museum of the Moving Image in New-York have an Odyssey on permanent exhibition. Odyssey has also found its place in many international museums (Germany, Japan, etc.). 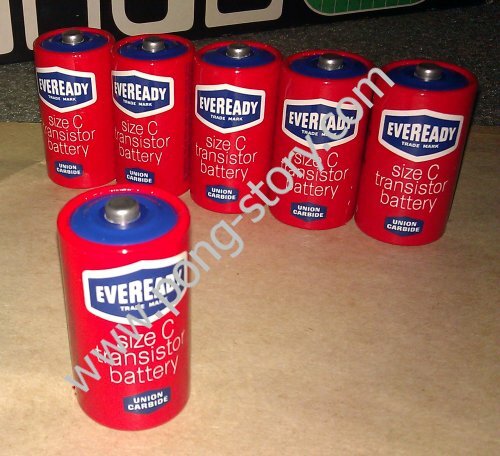 *: The six Eveready batteries sold with the system were red with blue top. Other models (Rayovac, Magnavox, etc.) are not originals. Remember that a lot of people used batteries with their Odyssey and often changed them, so finding the originals remains very rare. The following table may be of interest: it shows the variants that have actually been made. 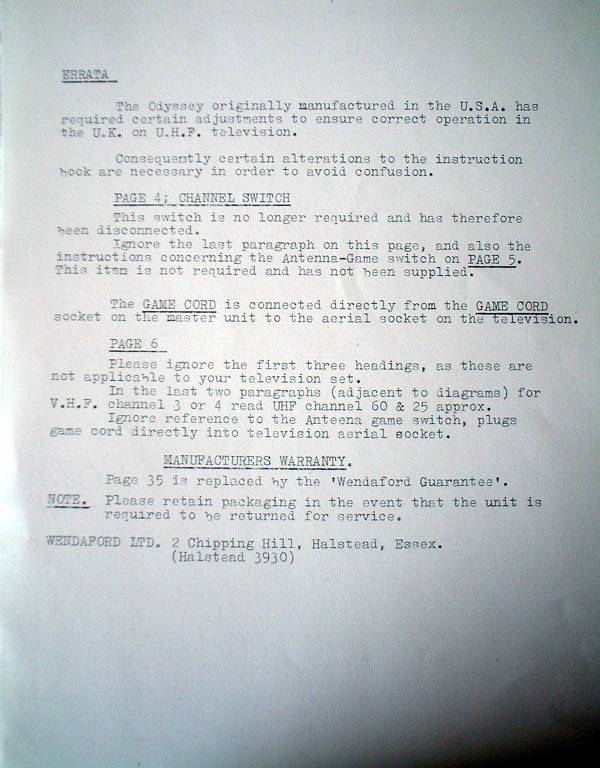 This exclusive information was compiled using unique original Magnavox documents from David Winter's collection. In case of further updates, please do not copy from this page but link to it. The model, serial and RUN numbers are written on the under side of the Odyssey unit as well as on its punched Instrument Inspection Card. The RUN number stands for the production run, which is either 1 or 2. There are three models of Odyssey sold in the USA: 1TL200BLAK, 1TL200BK12 and 1TL200BL99. They mainly differ by small eletronic changes and minor variations of game accessories as listed below. 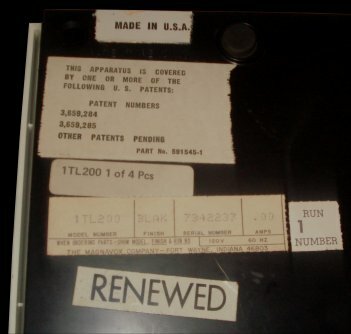 Model 1TL200BL99 concerns specimens sent back to Magnavox for warranty renewal. Except for early renewals, renewed Odyssey units had their model updated to 1TL200BL99 and a new serial number sticked over the original (serials originally sticked inside the unit were left). 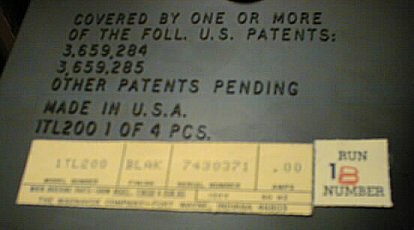 Serial numbers start from 06xxxxxx to 11xxxxxx (the first 0 was not printed) and are not incremental: some starting with 70 can date early August 1972 although some starting with 69 can date weeks later. If you are curious about when your Magnavox Odyssey console was completed, refer to David Winter's Odyssey Dating article. When most of the 1972 stock was sold, Magnavox decided to produce another large batch of units (i.e production run), hence the second RUN. Minor changes were made to the hardware. The second RUN includes not only 1TL200BLAK units, but also the second model (1TL200BK12) which had a few more hardware changes. The first RUN is either printed on a small white square sticker right to the serial sticker or stamped in red on the serial sticker. The second RUN is always stamped in red. Specimens happen to have an additional A or B letter on the RUN number. The B letter means that the batteries were replaced by Magnavox later in 1973 in the many unsold units which have been kept in stock for one year (or almost). The A letter is obviously rarer than the B but is considered being a typo. It also does not involve earlier serials than those with the B letter: the only units known to have the A letter were all produced in October 1972. 1TL200BLAK 1 Original model made in 1972 only. 6TL200BLAK 1 Odisea (above model modified for Mexican export). 1TL200BLAK 2 Second run of original model made in 1973 and 1974. ODYSSEE 5887 05 01 NONE Original German Export Model made in 1973. German (unit has plastic text overlays over US text). 1TL200BK12 2 Second model made between mid-1974 and fall 1975. Late specimens have a Magnavox logo on front side. not to be confused with the 1972 Mexican Odisea). in the USA, another in Brazil (see the exports below). Back in the 1990s, the few Odyssey web pages listed two types of consoles: Type A (which came with 12 games) and Type B (which came with 10 games). Several Odyssey units were also found with a red B letter added to their RUN 1 label (see above picture). Later, David Winter found that the Type B corresponded to an export version. To avoid confusion, he decided that the old Type A and Type B would be renamed US Model and Export Model respectively, and that RUN-1 labels with a stamped letter would be called RUN-1A and RUN-1B depending on the letter. The above pictures show the first production run both in 1A and 1B variants as well as the last model, which only exists in RUN 2. Although most of the Export units were indeed exported to Europe, a few were found in the USA. To learn more about the export versions of the Odyssey, scroll down below. The circuit boards of the cartridges can be made of beige epoxy or bakelite (brown or dark brown). Both types were used since 1972 and are sometimes mixed. The hand controls originally had glossy labels, but they were later replaced by mat ones. The screens on the user manual cover were originally pink. Red ones replaced them in late 1972. For this reason, late 1972 specimens may have either colors. Export units have a slightly darker red color. The Receive a FREE bonus game paper is often pink but also exists in white color. The stickers were originally provided on a single sheet. They were later split in two sheets during the 1TL200BLAK RUN 2 production. When present, the Magnavox logo on the front side indicates a 1975 specimen (early 1975 specimens may not show it). The red/green/blue chips exist in two variants. The operation of the Odyssey is very basic. 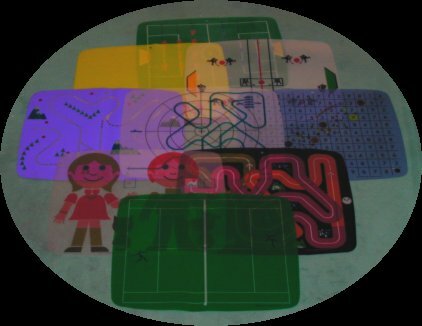 Most of the games used special plastic overlays placed on the television screen to simulate the background graphics that the system could not draw. Each of the twelve games had two identical overlays in order to fit on a small or a large screen. Some games used a special scoreboard to mark the scores. Some others used plastic chips, cards, or other accessories such as a pair of dice, small chips and game decks. Several games used the same cartridge. The difference was made by using accessories or by changing the game rules, since the games were mostly played with the accessories rather than with the elementary graphics shown on the screen. Collectors interested in the complete set of accessories can have a look at the list of Odyssey accessories. Some games even used two or three cartridges: the game started with a specific cartridge and continued with another one after specific events. Since both players are located by the horizontal and vertical controls, turning the system off by changing the cartridge did not alter their positions. Some notes were also used to play casino games like roulette. 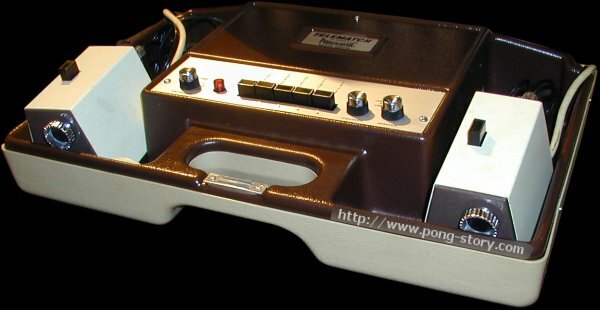 Both hand controllers used rotary knobs to move a player. Some games used chips and dice. In addition to the games provided with the console, customers could purchase additional games from Magnavox retailers, or order them by mail. Ten different games were released: six in 1972 and four in 1973. All were available individually or in packs of six. Magnavox also promoted the Odyssey by offering PERCEPTS, a free bonus game sent by mail to customers who would fill and return the Receive A Free Bonus Game paper to register the purchase of their Odyssey. Apex-Magnavox (Miami, FL) released a special 2-in-1 blue card to play Handball and Volleyball (which were available individually from Magnavox dealers or by mail order). It is possible that this blue card was a bootleg. The original Brown Box prototype allowed playing some games with a light gun. 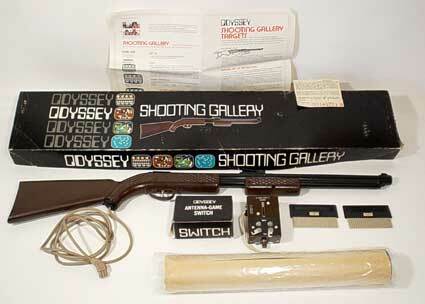 Thus, the Odyssey had a special connector to plug in a rifle which allowed playing four extra games using two additional cartridges (#9 and #10). This rifle pack is called Shooting Gallery. Because of its limitations, the system could not determine whether the rifle was pointed to the television screen, so one could point it to a light bulb, thus simulating a true shot on the screen. The picture below shows the four games included with the Shooting Gallery pack. Various Odyssey pictures can be seen on another page by clicking the pictures below. Left: unreleased Odyssey Round Ball - Right: playing with the Brown Box. Odyssey was first announced to the public in May 1972. Although a couple pre-production units were distributed in May for demonstration purposes, the production started in August. Nationwide advertising of this system on television and radio resulted in a real success: over 130,000 Odyssey and over 20,000 rifle packs were made in 1972. More might have been sold if some of Magnavox’ advertsing had not confused TV viewers into believeing that the Odyssey system would only work with a Magnavox TV set. Perhaps this was done by Magnavox to increase the sales of their own name-brand TV sets, but persistent rumors to this effect confused potential customers and did not help sales. Another 200,000+ Odyssey and 50,000+ rifle packs sold between 1973 and 1975, bringing the total to 330,000+ Odyssey and 80,000+ rifle packs sold. 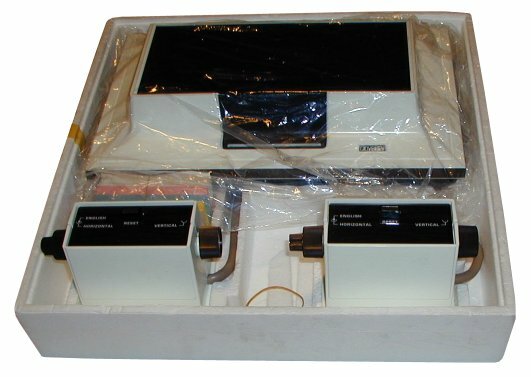 The system was removed from the stores in late 1975 and replaced by two new, simpler models: the Odyssey 100 and Odyssey 200. As can be seen in the advertisements below, Magnavox made significant discounts to sell more Odyssey units. The original $99.95 price was rather high, and the console was already discounted at $79 in late 1973. With the purchase of a Magnavox 17" color or 19" black and white TV (or any larger screen size), one could get his Odyssey for only $49.95 in late 1973. As mentioned earlier, Mr. Nolan Bushnell, President of Atari, attended a demonstration of the Odyssey game system laid on by Magnavox on May the 24th of 1972 at the Airport Marina in Burlingame, CA. 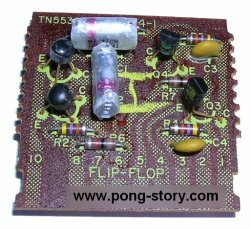 After founding Atari on 27th June 1972, Bushnell and Alan Alcorn (his first employee) designed the famous prototype of their PONG arcade machine. Once finished a couple months later, it was placed on trial in a local bar called Andy Capp's Cavern in Sunnyvale. Later in 1974, the arcade video game business having flourished, Magnavox filed a lawsuit for patent infrigement against Seeburg, Bally-Midway and Atari. Although Bushnell insisted that he didn't copy the Ping-Pong (Tennis) game of the Odyssey, Federal District Court judge John F. Grady was not convinced that Bushnell had designed PONG before attending the Odyssey demonstration. Mr. Bushnell opted out of the lawsuit before it began and became Magnavox first sublicensee. 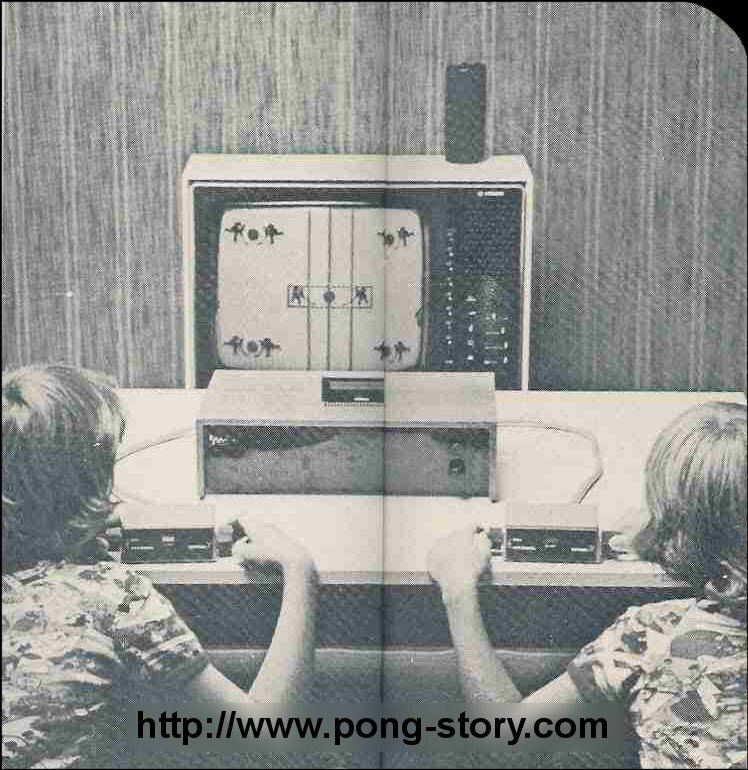 Henceforth, they paid royalties to Magnavox in order to legally manufacture and sell PONG systems. The suit against Seeburg and Bally went forward and marked the very first law suit in the history of the video game industry. The Sanders/Magnavox team won this suit as well as later law suits in the Court of Appeals. Much money changed hands. Additional patent infringement lawsuits vs. Mattel, Activision, Nintendo and several arcade game manufacturer went to trial over the next decade. All of these lawsuits were won by the Sanders/Magnavox team and, along with income from many patent licenses, brought in a total of close to a hundred million dollars over that period of time. The lawyers at Sanders made everything to avoid that Ralph Baer be aware of these amounts. Ralph only discovered this in 2002 with David Winter while visiting the former lawyer company in charge of the various litigations. As he said: "I had a great run and invented many other things", and didn't really care. Odyssey originally sold in the USA only, but was later exported in small amounts to several countries, and has even been cloned. Several types of exports exist: the US Version, and the Export Version released by Magnavox in 1974. The very first export of the Magnavox Odyssey, the Magnavox Odisea, was made in Mexico around October 1972 following a very successfull market survey a few months before. It consisted of a US Odyssey with the top of the box relabeled with a very nice Magnavox logo and large Odisea words. The States game was replaced by the Volleyball add-on (a yellow sticker was even put on the side of the box). All paperwork was made in Mexico and printed in spanish. Less than 4,000 Odisea units were produced. 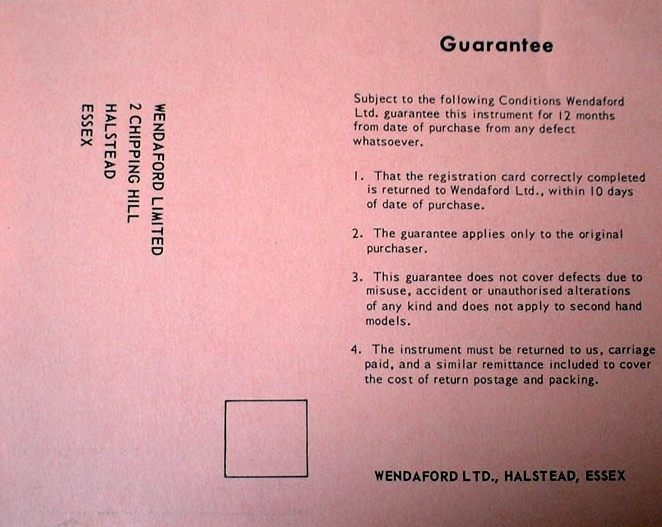 In England, modified US Odyssey units were exported around 1973 and sold by Wendaford Ltd., who inserted additional papers explaining their local guarantee as well as important operation instructions. Odyssey units were modified to become compatible with local television sets. In Egypt, a few US Odyssey units were reported, but it is unknown whether they were a US or Export version, and whether they were adapted to local TV sets. In Brazil, Magnavox exported the Odyssey in late 1975 under exclusive licence with Planil (Rio de Janeiro). A US version with all text translated in Portuguese, this particular Odyssey (model 1TL200BK13) was probably the last batch before the end of the whole production. Click here to download the Portuguese user manual (the Planil licence is shown on the back cover). The 1974 Export Odyssey differs from the above variants, and was sold in several countries listed on a large Patents Label sticked under the Odyssey unit. The two countries listed under Germany are Greece and Israel respectively. The french advertisement can be seen here. Odyssey was also exported to Singapore (export model reported: YE7100BK13). The Export Version (1974) differs from the US Version by several points. It came with ten games instead of twelve: five games of the original version were removed (Cat and Mouse, Football, Haunted House, Roulette, and States) and three others previously sold as add-ons were added (Soccer, also called Football in the USA, Volleyball and Wipe Out). The user manual was reduced from thirty-six to twenty-four pages. The Simon Says and Wipeout cards were translated to three languages (see some pictuers in the Odyssey Pictures page). Consequently, it had a couple overlays removed, a few accessories added (the Wipeout cars for example) and used cartridges #1, #2, #3, #5 and #7 only. Although this version was not supposed to be released in the USA, a few specimens were found there. In Germany, Odyssey was exported in two versions. It was first announced in late 1973 as being sold by ITT Schaub-Lorenz. Very few ITT units were made. The box was different, and the papers and game cards were translated to German. 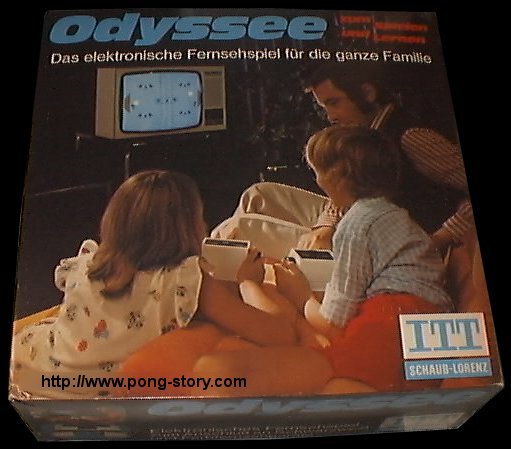 The console was also renamed Odyssee and its shipping box had two large ITT stickers covering the original Magnavox logos. These stickers are almost never found on Odyssee shipping boxes as their glue dried, leaving two almost black sides on the shipping box, allowing to see the original "Magnavox", "Odyssey", "1TL200" and "Made in USA" prints. The original user manual was replaced by two separate manuals written in German: one for the system installation and operation, and one for the game rules. English words moulded on the console unit were covered by transparent overlays showing their German equivalents printed in black. This Odyssee version was released in limited amounts in early 1974 (a few thousands). It was shortly replaced by the Export Version (named Odyssee, model YE7100BK11), which still had the two manuals translated to German and German text on the controllers. It is believed that ITT still sold this version in 1974 and that about 10,000 Magnavox units were exported to Germany in 1974 and 1975. Click here to view both versions of the German Odyssee manuals. In Italy, Odyssey got a last attempt circa 1975-76 as Odissea (not to be confused with the Mexican Odisea), distributed by G.B.C. Italia, the company which also imported Sinclair computers in the 1980s. 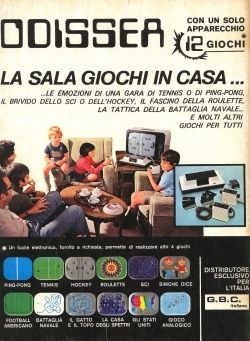 In the January 1976 issue of the Sperimentare magazine, the Odissea advertisement (scan courtesy of Carlo Santagonisto) clearly shows twelve games translated in Italian. However, the console itself is model YE7100BK14, the Export version with ten games, which seems to be a very last marketing attempt. The Shooting Gallery rifle seems to have been sold as well in Italy as one specimen came with its cartridges #9 and #10. The German Odyssee box released by ITT Schaub-Lorenz and the Italian Odissea advertisement. Click the pictures to view them in larger size. Although the Odyssey was legally imported to foreign countries, at least three clones are known to exist. In Spain, Odyssey was modified (or cloned) and called Overkal. In Argentina, Odyssey was also modified (if not cloned) and called Telematch De Panoramic (model J-5, which could stand for "5 Juegos" or "five games"), where Telematch is the name of the game, and Panoramic the distributor. Interestingly, both of these clones used a number of push-buttons to select the games instead of cartridges. Although the Spanish Overkal was a cut-down Odyssey with eight games, the Argentinian Telematch played only three Odyssey games (Tennis, Squash and Volleyball) but also featured two additional games: Submarino (a boat shoots a submarine with a torpedo) and Futbol (football with goals). This required additional hardware in the unit. Telematch De Panoramic is the only game system known to play the Torpedo game, also advertised for the German Interton Video 2000 and Spanish Tele-Tenis, but never released. For these reasons, Telemach De Panoramic only came with a carton board explaining the general operation and game rules. However, the Overkal was much more complete: it came with a detailed used manual, as well as set of overlays and accessories. In Sweden, an Odyssey clone called Kanal 34 was advertised in 1975 but very few specimens were manufactured. 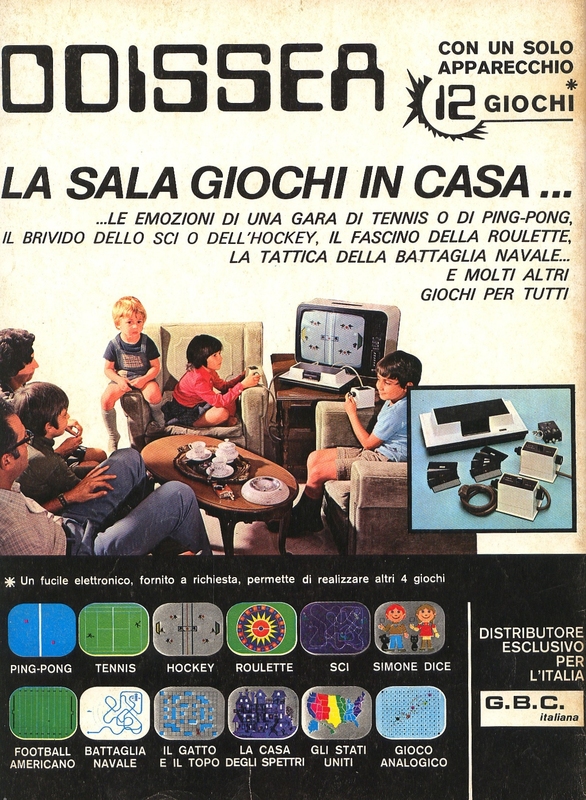 The advertisement below shows a different unit housed in a wood cabinet, using Magnavox Odyssey controllers, cartridges and overlays. 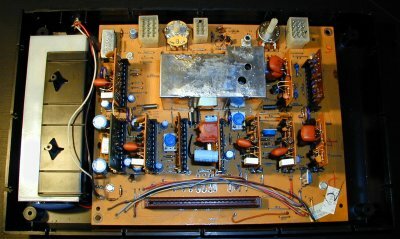 In fact, the main unit contains the Magnavox Odyssey hardware (Export version, either from a Magnavox Export or ITT Odyssee unit), with the cartridge connector fixed to the top board and wired to the circuit board. The original battery compartment was still used and located left to the mother board, like in an Odyssey. Interestingly, the ITT Odyssee was also sold in Sweden. It came with four manuals: the two original German ITT manuals, and xerox copies with Swedish text in place of the german text. It is believed that those ITT Odyssee were released around 1976/77, which is quite late for that game, but not surprising for the video game market of that time. Left: Kanal 34 (Sweden, 1975). Right: Telematch De Panoramic (Argentinia, circa 1975). Because of its mid-1960’s type of technology, the Odyssey is completely different from modern video game systems. It uses no microprocessor and has no need for memory. It is based on a hybrid analog and digital circuit design. 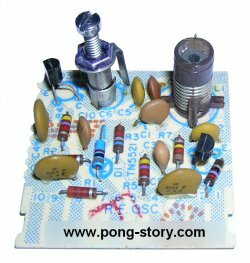 Opening the physical game unit reveals only discrete components: resistors, capacitors, etc. The only semiconductors are about 40 diodes and 40 transistors. 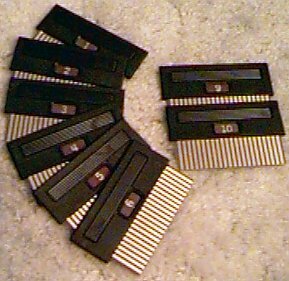 Odyssey’s cartridges contain no components: they are basically wirejumper sets. When plugging a cartridge into the console, internal diode logic circuits are interconnected in different ways to produce the desired result. As a matter of fact, the Odyssey contains everything to make a game based around a ball, one or two paddles representing the players, and a central or off-side vertical line which serves as a net or a wall. The cartridges act to connect the machine’s diode logic circuitry to set the aspect and the position of the vertical line (normally centered for ping pong and tennis but located on the left or on the middle for handball and volleyball respectively, or not displayed at all for Chase games and gun games), and to determine the interaction between the ball and the other graphic objects: bounce or erase either a player or a ball spot when there is a collision with a player or the central line (a player could even be erased after a collision with the ball). During the winter of ’72 – ’73 Ralph Baer designed several advanced cartridges equipped with some additional active components so as to add some more realistic features to the Odyssey. Unfortunately, Magnavox chose not to go along with these new ideas. Recently, Ralph rebuilt two active cartridges. One plays Tennis with sound effects, the other is a form of Squash with sound and an active wall which moves from left to right, thus increasing the game difficulty. between the slot and the connector on the circuit board. Click this picture to view the (very large) schematic of the Odyssey unit. You can also download the full Service Manual of the Odyssey. From left to right: RF oscillator module, main board with all modules, and one of the two flip-flop modules. Click those pictures for more information about the Odyssey modules.